If Melbourne does one thing right, it’s waterfront paths. 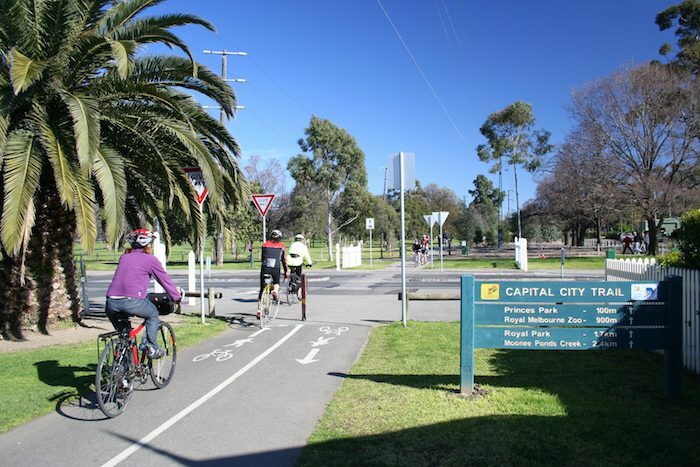 The crown jewel of these is the Capital City Trail, which tracks the Yarra River through the central part of the city. This mostly paved path is the main connector for getting around the city and its parks via bicycle, but it’s also a great flat loop to hop onto for a run of any length. The main section of this trail starts out near the touristy Federation Square. You’ll get to run along Batman Ave (named for founder John Batman, not the Dark Knight). Continue along the northern banks until crossing over to Yarra River Reserve and Herring Island. Then, return via the south bank along Alexandria Ave. In total it’s about 11 km, but you can either do one bank at a time, or cross over on a footbridge midway to shorten your mileage. There are also lots of options to add on for length or variety, with parks and gardens near either side of the path, as featured in our other Melbourne routes. Or, hop off in the Toorak neighborhood for a look at some of the city’s more ritzy mansions. The best part of the Capital City Trail is it cuts through the center of the city, right near Flinders Street Railway Station.